Body feeling a little parched? THE SACRED RITUAL combined fours oils that work together to give your body everything it needs. Your skin will never feel greasy and those dry spots.... what dry spots ?! Shake before use. Pump a small amount into hands and massage into skin. Coconut oil is rich in fatty acids, lauric acid, and proteins to help hydrate the skin. Jojoba & meadowfoam oil provide anti-inflammatory properties to help reduce chafing and chapping of the skin. 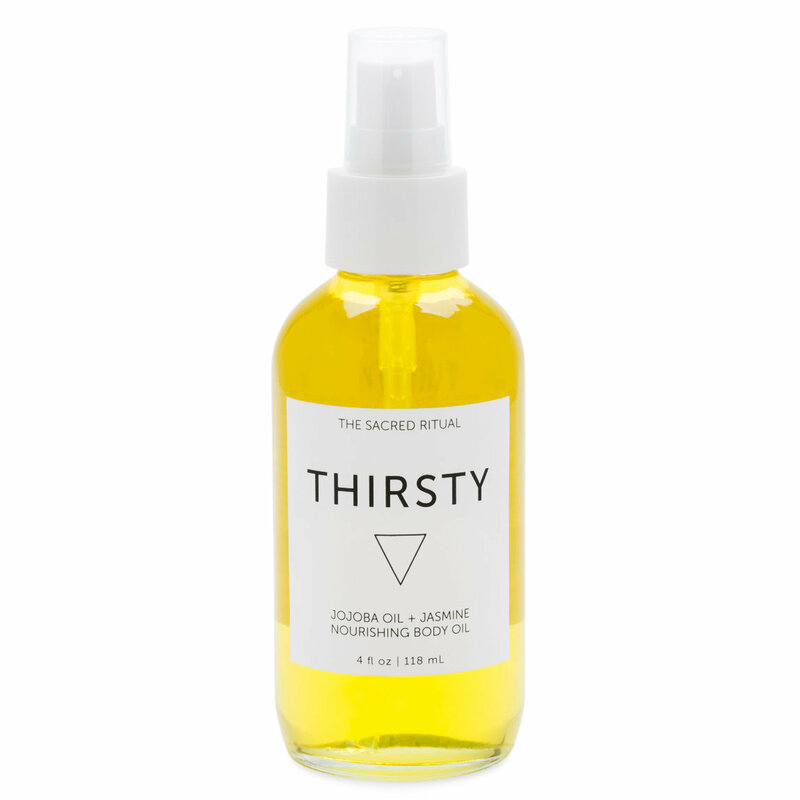 Vitamin and antioxidant rich oil create a barrier to lock in moisture and deliver nutrients. Safflower seed oil hydrates the skin to help prevent dryness and roughness while leaving a subtle glow. Jasmine & bergamot essential oils to help brighten and smooth skin. I absolutely love this oil. I suffer from extremely dry cracked hands and eczema and this oil is the only thing that allows me to go all day without any pain. It absorbs super fast but keeps my skin feeling hydrated and nourished. LOVE THIS STUFF! Part of my daily ritual..
Oh my god, if you've ever wanted to give yourself a luxurious treatment and smell delicious all day long, look no further this is the body oil for you. It not only has the most delicious scent, but it leaves my dry skin hydrated and soft all day long. It has a delicate scent which is quite soothing and not overwhelming at all. I personally love the smell (and taste) of anything with jasmine, this scent is more delicate and quite natural. The scent does linger, but as mentioned leaves you smelling fresh and is not over-flowery at all. I've been using this specifically around these cold winter months and I've found my skin feeling softer and nourished. If you're looking for something luxe to nourish your body look no further and give this a try.